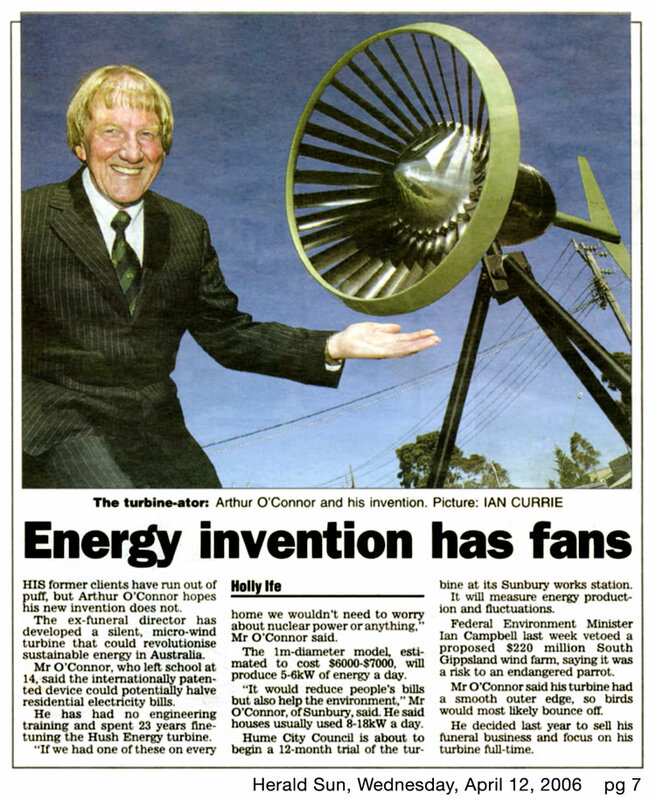 The O'Connor Hush Turbine was wind tunnel tested for energy output by RMIT University (School of Aerospace, Mechanical and Manufacturing Engineering) in September 2005. You can view the wind tunnel test Energy Output table on our website. 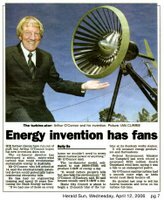 The 1m turbine is expected to be available for Australian households and businesses in the price range of $6,000 to $7,000. As a comparison, some solar options can cost around 75% of this price, but only generate around 1/60th of the power (around 100 watts versus up to 6,000 watts). That makes your investment much more effective. Due to crude oil rocket high price issues, many of us might rethink of using it or finding alternative way to save our hard earned money now. How?? Yes, there are many ways to get Green and Free Energy, like Solar, wind, waves, Hidrogen, .....etc. One of the Free Energy that we can consider is "WIND Energy", where the investment is lower than Solar and can be used for longer duration especially at night time (Of course it depends on windy conditions). Recently, I found a new type of generator on the internet its called "O'Connor Hush TURBINE". Turbine?? Yes it looks like the JET engine but the size is much small, which is only 1m height (Smallest one). The selling point is it generate "Low noise" and generate energy even at low wind condition compare to conventional type. The selling price is around US$6k to 7k each. (About RM24k to 28k) It is expensive for the beginning but for long run you might had saved more especially when we use Electric Car or many home appliances in future. What do you think about this business? We can be the dealers. Actually, that's in Australian dollars, AU$6000 to AU$7000 -- around US$4500 to US$5200.